My name is James Lowell Noxon. I was born in central Indiana in 1955. My mother was a nurse and my father was an electronic engineer. My family moved to northern Virginia in 1971, where I finished high school. My parents died in an airline accident in 1974 near Dulles airport. A few years later my older sister died at Jonestown in South America. I first met a Tongan family when I was living in Encino California in 1984, they were my neighbors. 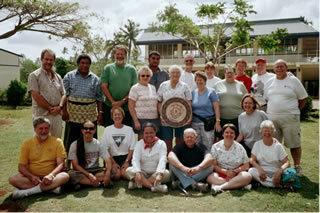 While living in Lahina Maui in 1997 I attended the Methodist church there, where there was a large Tongan congregation. The Tongan choir sang every Sunday, and I was hooked on that sound immediately. When I began to teach at the University in Hilo Hawaii, I attended the Methodist church there. The pastor, Sione Nukonuka Taukolo, is from Ha'apai and attended Taufa'ahau Pilolevu College. 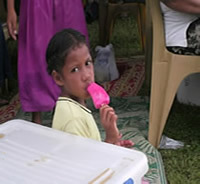 I came to Tonga the first time in the fall of 2004 with a Methodist volunteer group. During that trip I came to visit Ha'apai and to help them with their computers. They tried to bribe me to stay with lots of lobster. As soon as I returned to Hilo, I had culture shock really bad. They offered me a job in Nuku'alofa (the capitol of Tonga) and so I "postponed" the courses I had agreed to teach at the UH and returned to Tonga. I visited Ha'apai again and, with the financial support of my church in Hilo, installed a computer network with broadband internet access. Since I had been working towards a PhD at Indiana University, I had to return to finish it. Upon my return to Indiana, it seemed like everything possible went wrong. I really needed to go back to the islands, and so I did. I really think the Lord called me to service, and I answered. It's been a strange trip, as they say. I started playing music very young. In high school my buddy Preston Junkin invited me to come after school to play with the Stage Band. This was in Virginia shortly after moving there. I had never heard of Stage Band but I was like a duck to water, playing trombone and then piano. I started playing in pit bands for shows, and running light shows at rock concerts. I really got into the equipment side, and took a massive sound system with me to my first college in Florida. Everyone wanted this for their party in Sarasota. It was the era when one could work in a bar at age 18. No surprise that I soon switched major from physics to music and left school a year later. I had a chance to enjoy the life of a working musician when it was relatively easy to do it. Although I left that life after 10 years and began a second career as an electronics design engineer, it left it's mark on my culinary habits. I thought that living in Florida would mean an escape from cold weather but I was wrong. I moved to Oregon and this was where my 'music career' really developed. A major change in my life was going to Berklee College of Music. After that, I was playing jazz all the time: solo piano, duo and trio casual gigs, full band for society gigs, community jazz band, a full on jazz-rock fusion band for concerts. The era of music technology was just beginning, and I wanted to learn how to make computer based equipment so I went to UCLA. 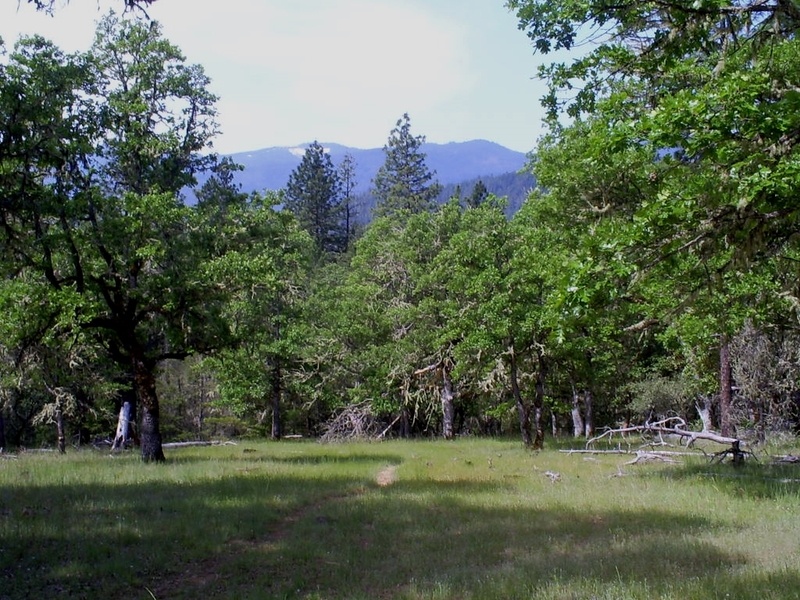 After a few years in LA I returned to Oregon, spending 15 years living there. I started my own manufacturing business and named it Midimix. 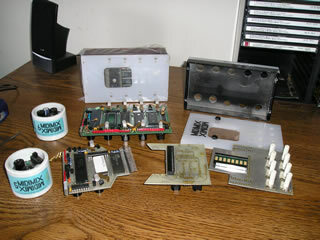 I had a chance to enjoy being an electronics entrepreneur when it was relatively easy to do it. I had 200 music stores as dealers, and they began to ask me to offer workshops and seminars in music technology. A guitar player I had worked with started up Musician's Friend, and I taught some there. I ended up getting the 'teaching bug' and decided that I really wanted to teach at the college level, so I went back to school after a 9 year absence and got 3 degrees to enable me to start a third career in college teaching. When I got to Indiana University, they really didn't know what to think of me. A guy who had played with Freddie Hubbard and Vinny Coliuta, who had run his own manufacturing business, coming back to college? But right away I started doing some teaching based upon my strength as a bridge between music and technology. I taught in Flagstaff Arizona and Hilo Hawaii for a few years, hoping to build up my resume and find the perfect job, but I still haven't. There are two reasons I think: one is the people who populate university faculty in the two departments - jazz and computer music. I have always liked the jazz faculty I worked with but the technology profs were closed minded. The other reason is related to the decline of education in the USA: mostly the professors I have met are more interested in having the school serve them and less interested in them serving the students. To me the joy of teaching is in having good students as well as really embracing the role of faculty in shared governance and community engagement. I have always been comfortable with the teaching part, also I found the best chance of finding good students is at the smaller schools and community colleges. I prefer schools which have a very broad demographic profile in student culture and age. Maybe New Zealand? There's a few random pictures of me on the left. In front of the church in Pangai, with 6 trained birds from my friend 'Bud the Birdman' in Maui, with my friend JB Dyas at USC where he teaches at the Thelonius Monk Institute, with my friend Rhett who plays drums with Willie Nelson, playing piano at Michael Paul's in Lahina, playing bass with the Jazztet at the Chatterbox in Indianapolis, teaching music technology at IU, and teaching first grade in Waimea on the Big Island of Hawaii. The One Laptop Per Child project was something I tried to get going for Tonga. I had applied to the graduate program in the MIT Media Lab to work with Seymour Papert, one of the education genius there. Unfortunately while visiting Viet Nam, he was struck by a motorcycle and never fully recovered. The project was put into Niue instead of Tonga, which is the next island nation to the east of Tonga. It is only one island and I am sure the logistics were far simpler for MIT to do it there. The idea was to get every student to have their own laptop computer, and I do mean EVERY! The project was put together by some MIT professors through a spin-off headed by Nicholas Negroponte. I thought this would be a great place to test out the full implementation of the concept; there are 21,500 students in Tonga and unlike Brazil (5 million) every student could get one within a relatively short period. There is a lot of computer awareness (students study computers throughout their schooling) and internet access is available. The biggest issue for me, as a christian teacher, is the software piracy. The XO, as the little green laptop is called, runs Open Source software that is freely available and which can be freely modified by students. Anyway, laptop computers are now cheaper than ever. You can help me if you wish to. I am not a 501.c.3 non-profit, just a guy doing what I can. I am not going to ask for money, but I would accept it and in turn I would send you photos of how I use it. You can write to me or PayPal me funds at this address: teachtonga (at) gmail.com I have a student loan to pay off (6 digits!) and this will eventually force my return to accept a teaching position somewhere. Hopefully I can forstall this for a few more years, and then find a university that will also support my work here in Tonga.